Home/Products/Parker Hale/PARKER HALE BOLT ACTION CUSTOM SAFARI RIFLE IN .375 H&H. PARKER HALE BOLT ACTION CUSTOM SAFARI RIFLE IN .375 H&H. 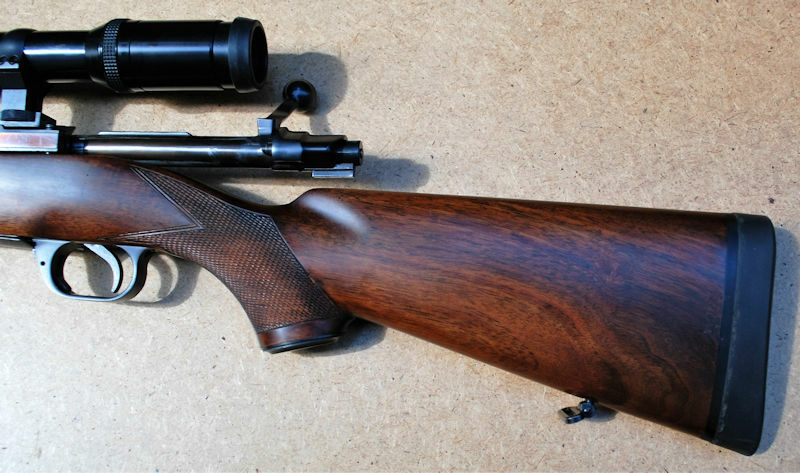 Quite simply a TRULY STUNNING example of a CLASSIC SAFARI CALIBRE from this ICONIC and CLASSIC BRITISH RIFLE MAKER. Parker Hale Bolt Action Custom built Safari rifle in .375 Holland and Holland. Rare enough from this manufacturer, in this calibre, at the best of times THIS is no standard rifle from them and has certainly been a ‘One Off’ Handmade example specially commissioned for something or by someone. I only wish records were available because this rifle would certainly make for good reading and research. It is a great shame as its actual history would be fantastic to know. The full length 21 ¾” barrel is just about pristine inside with little, if any, evidence of being fired much, if at all. With the fixed ramp mounted open sites offering a set 50 yard blade as well as folding leaves detailed for 100 and 150 yards it is perfectly set up for use as a bare rifle with the iron / open sights. In reality the only thing missing from the gun is the original front bead shroud / protector but I will have a contemporary replacement in the work shop if required. The front rifle sling also follows the classic safari rifle style and is via the fixed barrel band. The action has Tastefully and Deeply Cut Hand Engraving and both are in pristine Blue / Brown finish with colour hardening to the full length extractor claw as well as the bolt release lever. Finishing the metal work off is the barrel mounted front scope mount band supporting the Quick Detachable, Return to Zero Claw / Pivot mount with the rear scope base screwed down to the rear action ring. The mounts also include a peep through facility for any unexpected ‘close quarter’ moments! Set into these top quality mounts is a Swarovski 1.5 – 6 x 42 power rifle scope sporting a 3 way duplex set in the FIRST FOCAL PLANE (so the reticle grows and reduces along with the magnification choice). As such this is perfectly suitable for relatively close range encounters, through to driven game hunts for things like wild boar etc. and even longer range stalking for stags or larger plains game. The nicely straight grained (so very strong) stock measures in at 14 ¼” including the inch deep recoil pad and still supports nice crisp chequering. Finishing the rifle off is the hand finished hinged magazine floor plate which is also engraved and detailed with ‘CAL .375 H&H MAGNUM’. ANY maker, even the best London names (or for that matter World Wide) would be happy to put their stamp / details to a rifle of this quality. In reality Parker Hale have to go down in history as ‘one of the best’ the world has ever seen too. They may well have catered more for ‘the masses’ with their prolific output as opposed to those individuals lucky enough to be able to order bespoke firearms etc. but this particular example is proof that they could also and did produce the highest quality weapons equally as well as anyone. If this was new and from the cartridge manufacturer, in the same specification as this is, you would be looking at a current retail price in excess of £30,000 for what would be effectively the same rifle …… (PLUS VAT) and very likely a year or two timescale for completion to take possession. Now while there are still those lucky enough to be in a position to place an order for something like that the average fella is not. This gun WILL however, hold its own in any company. It IS a rifle I am actually happy to hold on to until it finds the right new owner! In reality it needs to go to someone who has a genuine need for a piece of TOP QUALITY equipment like this, not just for a ‘one off trip / safari’ to then sit, nostalgically, in a cabinet for the next 25 years. Someone living and working in a place and environment where they would have it and need it with them every day. A professional hunter who realises, understands and knows what I am trying to say and convey here. If you do then good. If you don’t then don’t worry about it. ….This rifle is not for you!